At B&B Farms, we strive to cultivate community; connect local farmers, artisans and eaters; provide our customers high quality, healthy produce and create a meaningful on-farm experience. GROWING PRACTICES. Sustainable. We grow using Integrated Pest Management (IPM) and organic practices (not certified) that work for us. IPM allows us to reduce spraying and avoid crop loss, helps keep costs down and protect beneficial insects. Our plan is good field records and soil management using cover crops and crop rotations to break up pest and disease cycles. For weeds, we use tractors, mulches, hands and knees hand pulling/hoeing and where appropriate, use little or no herbicide. Our farm is an open book; we are willing to discuss how we grow it and why we do it. We eat this food too! ETHNIC CROPS. Our involvement began with Morris Gbolo. We learned to grow vegetables from his native land, Liberia, West Africa. We thank Morris for introducing us to a taste of his homeland and his friendship; we are grateful for his contributions. Morris' accomplishments at B&B Farms have led him to pursue his dream of having his own farm. Best wishes to Morris and his farming success. 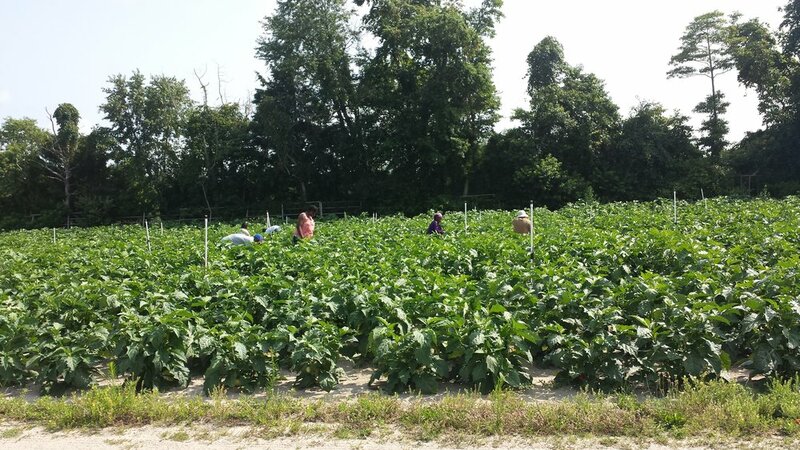 At B&B Farms, we are proud of our ethnic pick-your-own crops and to serve a diverse South Jersey.